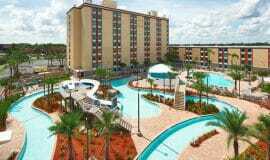 The Brand New Red Lion Lake Buena Vista Hotel with Waterpark just opened in September of 2018. The huge selling feature of this hotel is obviously the extremely nice pool area complete with a water slide and a lazy river. This recently renovated hotel is seated on six landscaped acres and located within a mile of Disney’s Animal Kingdom Park. This hotel is all you would ever want. 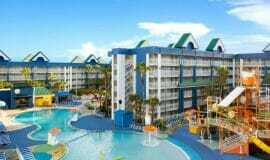 Its located smack dab right in the heart of all the “MAGIC” that has come to make Walt Disney World the most popular family destination in the world. The Hilton provides exceptional deluxe accommodations, great service, and complimentary shuttle service to all the Disney World attractions every 30 minutes. You desire fabulous food…the Hilton boasts of seven restaurants on site from Andiamo Italian Bistro & Grille, Benihana and their 24 hour gourmet Mainstreet Market. On Sundays they offer a Character Breakfast. You want a fabulous photo opportunity…then you will want to make reservations. 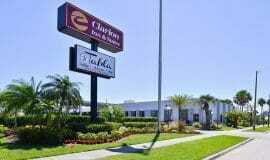 The Red Lion Maingate Resort is located literally next door to the Walt Disney World resort, yet in a perfect spot close to other attractions, dining, and shopping on popular Highway 192. Don't worry about traffic because the hotel is just a couple of blocks from the Sherbeth Road entrance, a nice little secret that you can use to get to the Disney parks with no hassle or delays. This "Newly Renovated Resort" is close to I-4 and the 429 toll road, with other major attractions like SeaWorld Orlando and Universal Orlando Resort, home to the Wizarding World of Harry Potter, just 14 minutes away. 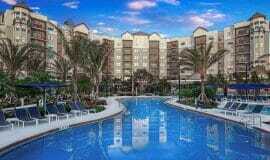 This hotel is located only 13 blocks from the entrance to Disney World. They offer FREE scheduled shuttle to all the Disney World Theme Parks They also run a shuttle schedule to SeaWorld, Universal Studios and the Premium Outlets Mall. The hotel was completely redone in 2012. These are the most spacious of rooms you will find in the Disney World area. 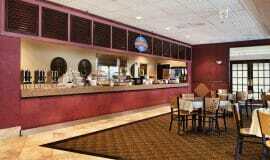 All rooms have two Queen beds, flat screen televisions, microwaves and refrigerators and FREE coffee pots. This property carries the highest distinction of any Holiday Inn in the market and you are so close to WDW, you can feel the Magic. 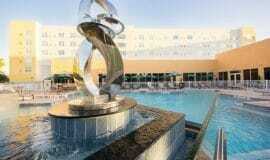 The newly re-opened Grand Hotel is as the name says within blocks of the ever popular Universal Studios. All new furniture, new carpets, new bedding, new bathrooms, new flat screen tvs, new everything down to landscaping…it is most accommodating and fresh. 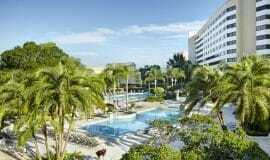 The Grand offers a full hot breakfast for a family of four along with Free scheduled shuttle service to neighboring Universal Studios, SeaWorld along with Walt Disney World. 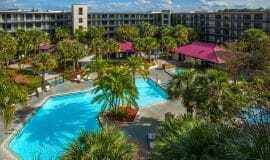 Even though the Buena Vista Palace Resort and Spa with a 1,014 rooms is right on Disney property, you'll be amazed at the reasonable cost, especially when you consider the amenities. They include three outdoor pools, hot tub spa, children's swimming pool and playground, tennis and volleyball courts, in-room refrigerators, pillow-top mattresses, in-room WIFI, and furnished balconies in most rooms. There's a shuttle every 30 minutes to the Disney theme parks, and you're literally minutes from both SeaWorld Orlando and Universal Orlando Resort via either I-4 or the low-traffic back road routes. Do you want to stay inside or outside the Walt Disney World complex? The advantages are many, but the most important has to do with shuttle service. If you are staying inside the complex, the shuttle to the theme parks runs every 30 minutes. Generally staying offsite, a hotel may provide a schedule shuttle which runs once or twice in the morning and the same return schedule in the evening. The Best Western inside Disney World offers a wide list of amenities including two queen beds in each room, and a furnished balcony. 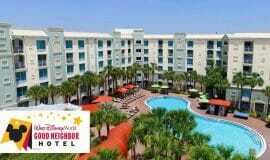 If you are doing Disney and you desire convenience this Resort Hotel has it all. The property was brought to the market as a condo hotel in 2007 and is located literally 13 blocks from the back entrance to Disney World. The theme parks at Disney are accessible by the FREE scheduled shuttle the hotel offers. Check out the nightly rates…they are awesome and for a product of this magnitude it is truly remarkable. The Saratoga Premier Resort by Best Western is a perfect place to accommodate a family gathering, group of friends or employees on a business trip. The reasonable rate for a beautiful space makes these villas the perfect home base for an epic Orlando vacation. Our goal at OrlandoVacation.com is to provide you with everything you need to make an informed decision on the best Orlando hotels near Disney World for your family at the best price. With almost 20 years of hotel experience, we’re familiar with the ins and outs of bookings, vacancies, availabilities and where to find the very best bang for your heard-earned buck. 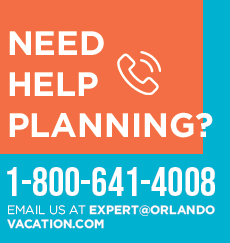 OrlandoVacation.com is proud to have partnered with a select group of hotels near Disney World that we feel deliver the highest quality in accommodations and location, while offering remarkably reasonable prices. By working with a smaller pool of high-quality, select hotels, we are able to present exceptional service and savings to our customers. 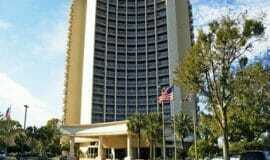 Above are listing of available accommodations in our partnered Orlando hotels located in and around Disney World and Universal Studios Orlando These properties have three things in common: Their close proximity to (or within) Disney World, their exceptionally low rates and their staff’s exceptional customer service. Your perfect Disney World vacation starts here.